Who in the world does not like music? But we do not always find the songs that our ears crave for. The collection of CDs may not have each and every song of heart’s choice, and at times we may not have Internet access everywhere we go. Gaana is precisely the brilliant outcome of a business idea that became a roaring hit with the music listeners. Gaana.com comes as a boon to satisfy the music enthusiasts with strong Indian connect. A music streaming service dedicated to providing licensed music to users for free. 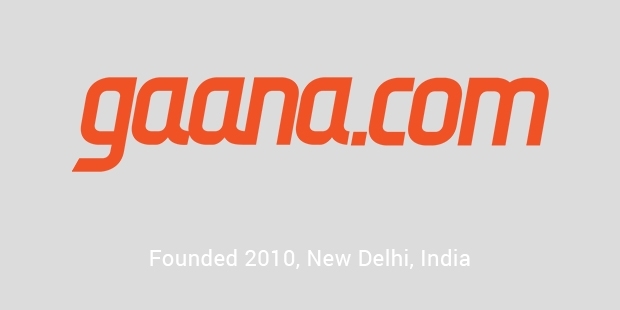 Launched in 2010, Gaana offers both Indian as well as international music content. Users from different parts of the world can access the available music catalog, including music in 21 different languages like English, Hindi, Punjabi, Telugu, Marathi, Tamil, Marathi etc. You can either access gaana.com online, or download the Gaana app on your mobile device, in order to enjoy your favorite numbers on the go. Gaana allows you to make your playlists public so that other users can view it, and make them their favorites if they like. The best thing is that this mobile app has been designed to support a wide range of operating systems, including iOS, Android, etc. This app offers unlimited access to all your favorite songs absolutely for free, including Bollywood music, music videos and radio Mirchi right on your mobile phone. Gaana.com is one of the biggest music broadcasting services over the Internet. The software enlists a collection of old classics to new song hits, where you can enjoy thousands of songs for free, that too in your own preferred language. In addition to that, you can also try the discover section of tracks, where you can listen to a varied selection of playlists, including romantic, devotional, sad songs, Ghazals, Bhajans etc. Gaana Online Radio feature of the app allows you to enjoy endless stream of music, giving you several hours of enjoyment with your favorite genre. Latest updates in the app allow you to watch your favorite music videos, and also sing along with lyrics. Just watched a movie and like its songs, you can open the app on your handheld device, search for the latest hits, and you will find the entire list there and then. Gaana has a database of more than 3 million numbers, which you can save in your favorites, create playlists, and share with others. You may also search for music by genre, albums or artists. The app also allows you to listen to 5 radio Mirchi stations while on the go, along with non-stop radio channels. The music is updated everyday in English, Hindi, Bhojpuri, Tamil, Telugu and many other regional languages. As lyrics flash on your screen, you can even sing along and make an impression. 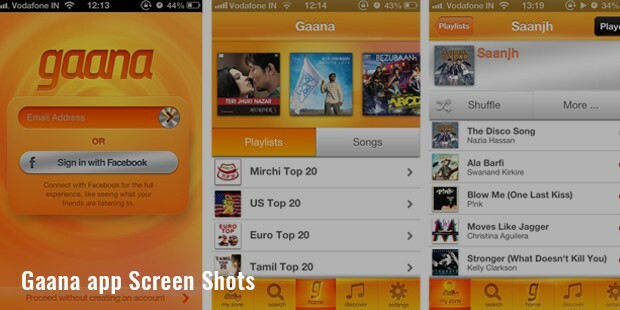 Gaana is free to download, but you can subscribe to the latest Gaana Plus version for enhanced user experience. Gaana is a must-have for any music lover, with instant access to favorite songs anywhere, any time.